I remember, ten years ago, hearing poet Anna Robinson identify the need for a magazine devoted to the longer poem. She spoke passionately and, soon after, created Long Poem Magazine. While readers were drawn to the concept – subscriptions are our lifeblood – high-quality submissions are the test of a journal’s worth and Long Poem Magazine attracted such major and patrician poets as Edwin Morgan, Maureen Duffy, John F Deane, Yang Lian, Caroline Bergvall and Mimi Khalvati, who appears in this issue and whose long poem workshop inspired Anna. But who would have imagined that so many poets were quietly building epics with so little hope of journal publication before Long Poem Magazine? Long Poem Magazine has always encouraged lesser known poets – it’s always the poem that counts. We are ambitious for contemporary poetry; we reach across continents to find the many ways of extending a poem, and we present a variety of stylistic approaches. Balladeer, modernist, surrealist, confessional or whatever poet you identify as – your work will be included here if it takes skilful advantage of the glorious opportunities of a long poem. What are those? Mimi Khalvati, quoted in the editorial for Issue One, says a long poem is: ‘as much a space to flex one’s muscles, grapple with problems, identify weaknesses, as it is to mine rich seams, give way to obsessions and vent to narrative.’ Fitting for a magazine not afraid of length, depth or breadth, we give big-field page size to present our poems. The magazine has doubled in page number since its early days. Every issue is an anthology of the best contemporary long poetry. We care, also, that the idea of the long poem, once thought outmoded, impractical for journals or even boring, is grappled with. 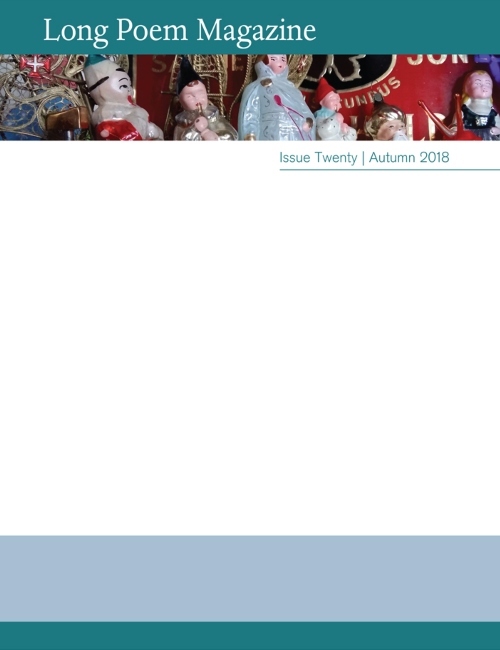 Each issue has a long essay by such practitioners as Vahni Capildeo and Tim Dooley; Angela France, who has spent the last year touring a show based on her book-length poem The Hill (Nine Arches), illuminates the long poem of place for issue 20. A hallmark of our house style is to require the poet to introduce their poem’s process, rather than their own biography. Long Poem Magazine’s twenty issues provide a rich compendium of insights into how poets work. In this issue, for example, Kate Ling describes the long gestation of her poem, ‘Photographs’, as a ‘verse diary’, which ‘began as a series of poems written over eight years, from drafts made in a holiday chalet and on beaches along the Ceredigion coastline.’ Most pleasingly, the magazine has grown in popularity throughout the world. If there is another English-language journal devoted to the long poem, I have not found it. This issue, like most, has a share of translated poetry, including Sarah Kersley’s stunning translation of a poem by Brazilian poet Carlito Azevedo and Timothy Adès’ hilarious offering of Bertold Brecht’s animal poems. We will be celebrating Long Poem Magazine’s tenth birthday during the coming year. With issue 20, we will have published 307 long poems. This is the first issue, however, not to benefit from co-editor Lucy Hamilton’s dedication. I’m privileged to step into her place. When I was asked to co-edit a strong journal that has achieved distinction, I accepted straightaway, without thinking through the dedication it does, of course, need. I now realize the hard slog of previous editors, Anna Robinson, John Haynes, Anne Vaughan- Williams, Lucy Hamilton, and current editor-in-chief Linda Black (on board since issue 2). But there’s a reason we do this: the excitement of delivering such astonishing work to the world. I’m glad I jumped in. So please jump in now and read!